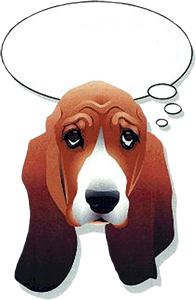 Please support these basset themed businesses of BROOD volunteers and supporters. The ultimate in dog clothes for dogs of all sizes. DOG QUILTS for pet parents! Over 50 breeds and counting, in a variety of pillows, wall hangings and quilts of all sizes. Accessories as well! Original pet themed gifts with 150,000 products in 270 dog breeds, 36 cat breeds, 13 horse breeds, bunnies, gerbils, goats, hamsters, iguanas and even moose! Dopey Dog Artworks - because pets need art too! Original art of dogs and people by Hazel Maunder. All custom art portraits are done from pictures and are available in acrylic, oil and water color. ABC Basset Hound Rescue's Slobber Shoppe has over 300 basset hound gifts perfect for the basset hound lover. Much of the merchandise is unique just to us and you won't find it anywhere else! All proceeds go to New York's Homeless Hounds!